A Great villa with space and views to relax and enjoy. 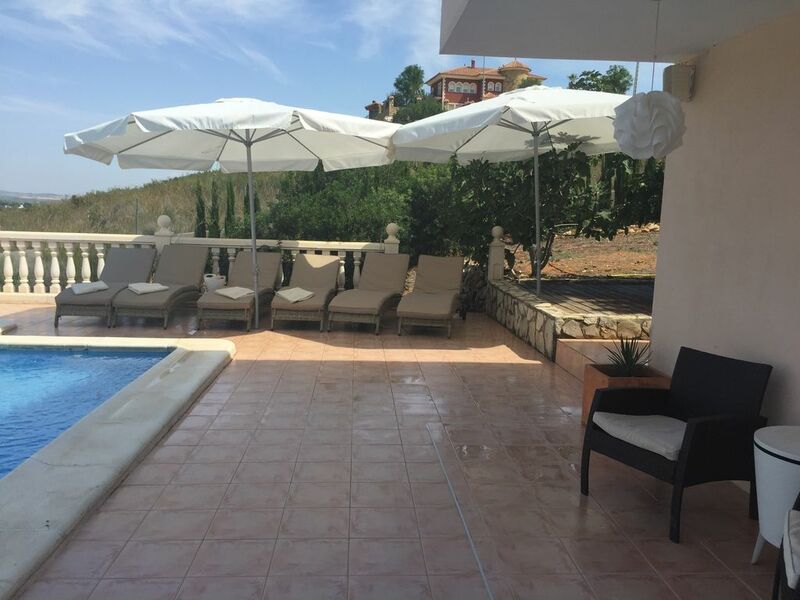 A recently constructed villa of good quality situated in a private urbanisation giving a quiet and secure place to relax with family and friends. Overlooking orange groves and the start of national park area. We offer a meet and greet service for our villa so you feel at home from the start. I am a builder who had the villa built by a local spanish builder, who i must say did a ok job. I have spent the last few years refining and finishing off spanish works to my standard. We had it built as a second home for us and have found that we don't use it enough and by renting it helps us to keep it up to date and in great condition as we love having our holidays here too. The furnishings are our style and are of good quality. Very relaxing and private.superb chill area by the infinity pool. toilet, shower, bidet, This is the main en suite with 2 sinks and vanity mirrors. toilet, shower, en suite with wash basin. Poolside shower room. with wc. central heating for colder month. we have multiple areas for dining in the villa and on the terraces. In living room with speakers poolside. There are quite a few steps into the property. escaped to relax and catch up with family and friends. Did just that in a tranquil and lovely house with lots of different areas to relax and chill. This was one of the most relaxing weeks we have had in years! Beautiful surroundings and fantastic villa, what more could one ask for. Well to start with the pictures don't do the villa justice. We were all really impressed with the layout both indoor and outdoor. The villa was spotlessly clean, with excellent amenities and incredibly spacious making it ideal for our family group aged 80-16. Helen and Spencer (local contacts) were on hand to help out if anything was needed and were extremely helpful. I can highly recommend both the villa and its owners. Thanks for letting us stay at the beautiful scenic villa situated in the orange groves (perfect for walking). The Villa and its amenities have been kept in top notch condition. Weather was amazing varying from 14-19 degrees perfect for a bit of winter sun. We have rented many houses in Europe over the years and this one rates amongst the best. My dealings with the owner Chris before we arrived at the house were friendly, professional and prompt. Once we had the payment organised, Chris e-mailed Helen (the local contact) to inform her of our arrival and we contacted her to fix up an arrival time on the Saturday. The house was easy to find as Chris had sent us through the GPS coordinates. We were greeted at the house by Helen, a lovely English lady who lives down the road and who looks after people whilst they are renting the house. The fridge was stocked with some food basics plus a bottle of wine and some beer. A nice touch. Then she showed us around the house and explained a few important details and then left us to enjoy the house and the surroundings. On the two occasions when we needed to contact her during the week, she replied promptly and things were sorted out quickly. Chis obviously put a lot of thought into the design of his house, the swimming pool and the exterior areas. The house is very nicely finished with top quality fittings and furniture. It's just what you would expect if you had your own high-quality home. For each time of the day, there's a balcony or an outside lounge area to sit and relax, have lunch, dinner etc. It's all very well thought out for the local climate. During our stay the weather was hot (35° at the hottest part of the day) and sunny every day and there's often a nice cool breeze running through the valley so you don't feel like it's too hot. The air conditioning works well and during our stay, we used it for a couple of hours in the evenings before going to bed. The air con. electricity is metered and Helen left us with a couple of prepaid cards which were enough for the week if you use it sensibly. We had a very relaxing time in the house. The pool is big with plenty of space for sunbeds and a splendid view out onto the orange groves. The environment is so quiet and peaceful which is perfect if you want to relax and wind down. You're also not far from the coast. The urbanisation is only 2k from the A7 por interior motorway so has easy access to all local areas & furter away places. There are so many days out you can do from here. There are beaches from valencia to javea all within a short drive or train ride. The nearby town of xativa is a historic town with a castle and many fine resteraunts & shops. 2k away through the orange groves is a village called antella where you can bathe in the river and is very popular with the locals. The rates shown are for the summer. if you want other dates additional discounts can be arranged dependant on numbers and dates. contact us. Downpayment / Deposit requested. Security deposit requested. Supplement for heating depending on the season. Discount depending on length of stay. Owner not present on location A 300 euro damage deposit is required either on final payment or on arrival. We have cameras installed externally for your safety and security.